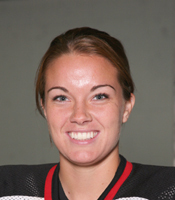 Lake Forest, Ill. - Lake Forest College women’s hockey player Laura Wilson (Corunna, Ont./Sarnia Sting) was named Forester Athlete of the Week on Thursday (November 9) for her performance the previous weekend (November 4-5) as the team recorded a tie and a win on the road. Wilson, a junior forward, scored Lake Forest’s first goal of the season in their 2-2 tie at Augsburg College Friday night. On Saturday Wilson tied a school record with four goals in the team’s 5-3 victory at Hamline University. She scored a power play goal in each period and added a shorthanded goal in the second. It was the second hat trick of her career and she moved into second place in team history with 28 career goals. The Forester Athlete of the Week is selected by the Athletic Department on Thursdays.